Nicest staff ready to great you with awesome attitudes. Refreshing when you've been on the road long enough to discover Rifle, CO!!! Very competitive rates, clean room, amazingly diverse and delicious breakfast. Under 100$, WiFi, cable, pool, Jacuzzi, refrigerator, Wal-Mart close by, and free breakfast. It was most definitely worth the price point. Cheaper than hotels in Glenwood springs. I am happy I chose to stay here. 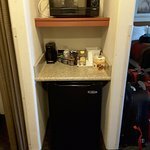 My husband and I stay at a lot of Choice Hotels in various parts of the country and Canada, so we have learned what to expect. The Rifle property was fairly standard although the granite shower surround and TWO granite shelves on which to place your toiletries in the shower was extra special. Too often the toiletries have to be put on the floor for lack of any type of shelf. The room held a king-sized bed and almost nothing else. It was smaller than most rooms which we understood when we noticed the housekeeping closet/room outside of our door. Although we are "elite gold" Choice Hotel members, we were NOT offered any sort of "gift" upon check-in which was disappointing. Sometimes a cold bottle of water or a light snack is pleasant after driving all day. The breakfast was the usual fare although we saw something we have NEVER SEEN BEFORE in the breakfast area - - a TIP JAR?!! We felt it was EXTREMELY TACKY AND INAPPROPRIATE to have a tip jar on the counter when part of the reason people utilize Choice Hotels is for the complimentary breakfast. I can't believe the manager allows for such a thing. Maybe he/she doesn't know it's there?!! Blown Reservations- Saved by the Manager! It's never a good thing when the front staff cannot find your reservations at check-in. Turns out, Kayak had directed me to the right website for reservations, but had changed the dates! Further checking revealed the great price was b/c the date was almost six weeks AFTER the night we were staying! Enter Mary, the manager, to save the day. She said this sort of mix-up had happened before (if you don't check your final reservations on-line) and offered to help. While Mary couldn't match the same room rate, she heavily discounted the rack rate for us to stay the night. In addition, she interceded with Comfort Inn to get us a refund on the improperly booked reservation. This is the type of personal service that gets my attention! The room was fine--a comfortable King bed and midline furnishings--nothing fancy. Really liked the bean soup and cookies that came out at 5 pm- a light meal was all we were looking for. Same for the included breakfast buffet, which was a cut above, with eggs, sausage and waffles, among other items offered. If I am traveling through Rifle again, I'd make a point to stay at Mary's Comfort Inn- AFTER I check my reservation before hitting the PAY button. David, It was a pleasure having you stay with us during your visit. I am so glad that I got your reservation taken care of. It is something that has been happening and it frustrates the traveler. As I stated to you, Please always check your dates when you reserve a room. This will take care of any issue. If you have any questions regarding any reservations that you book, call the hotel directly and make sure that all your requests are taken care of. Thank you once again Dave. 7/24 check-in went smoothly. We did not have a reservation but they welcomed us warmly and efficiently. Ample parking and free wi-fi so good economical choice for us. The pool was not working so our 6 yr old was disappointed. Cookie made up for it. As it was only an overnight stay, we got clean, comfortable beds and friendly and helpful checkin staff so we were pleased. Our room faced a horse paddock so it was blissfully quiet so we all got a good nights rest. Breakfast was the standard fare available at most Comfort Inn's so no surprises. Only thing I would note is do not get a room where the breakfast area is if you are not an early riser. A recent stay here was in line with what we expect from Choice Hotels. Very good in every aspect. Check in was smooth. The room was clean and spacious. We used the laundry facility and we're pleased with what we found. Breakfast was ok but pretty crowded. Restaurants in the area. We would stay here again.